1. Portrait of William Blake, verso pencil sketch. By kind permission of Robert N. Essick. ROBERT Essick has persuasively argued that a portrait of William Blake in his collection is a self-portrait and that it may be dated to the period Blake executed a number of miniature portraits under the guidance of his Sussex patron, William Hayley.1↤ 1. Robert N. Essick, “A (Self?) Portrait of William Blake,” Blake 39.3 (winter 2005-06): 126-39. On the verso of the self-portrait is a rough pencil sketch (illus. 1). The subject of the sketch is difficult to ascertain due to extensive soiling. In 1975, Martin Butlin suggested that the pencil lines on the verso constitute more than one sketch.2↤ 2. Martin Butlin, “A New Portrait of William Blake,” Blake Studies 7.2 (1975): 101-03. In order to facilitate his reading, Essick traced over the pencil lines in black ink (illus. 2), revealing, as he states, ↤ 3. Essick 132. Essick suggests that the sketch is by Blake while Butlin intimates that it may have been drawn by either John Varley or John Linnell. Butlin was the first to attempt an identification of the pencil lines, suggesting that there are parallels in “the [Smaller] Blake-Varley sketchbook.”4↤ 4. Butlin, “New Portrait” 102. Butlin uses this rather imprecise identification to support his main contention that the portrait was executed c. 1819-25 by Linnell, but, as Essick points out, Butlin does not identify a particular drawing or drawings in the Blake-Varley sketchbook. Essick offers a tentative identification, suggesting a lightly drawn sketch on page 40 of the sketchbook, which depicts an arched doorway and castellated walls. Essick also suggests that the sketch shares similar motifs with the Job illustrations of 1805-06, but does not claim to find an exact parallel or offer a precise identification of the subject.5↤ 5. Essick 133-34. Also see Butlin, The Blake-Varley Sketchbook of 1819, 2 vols. (London: Heinemann, 1969). There are two drawings by the miniature painter George Engleheart that appear to offer a more likely identification of the sketch than those hitherto mentioned. 2. Portrait of William Blake, verso pencil sketch with lines traced in ink. By kind permission of Robert N. Essick. 3. 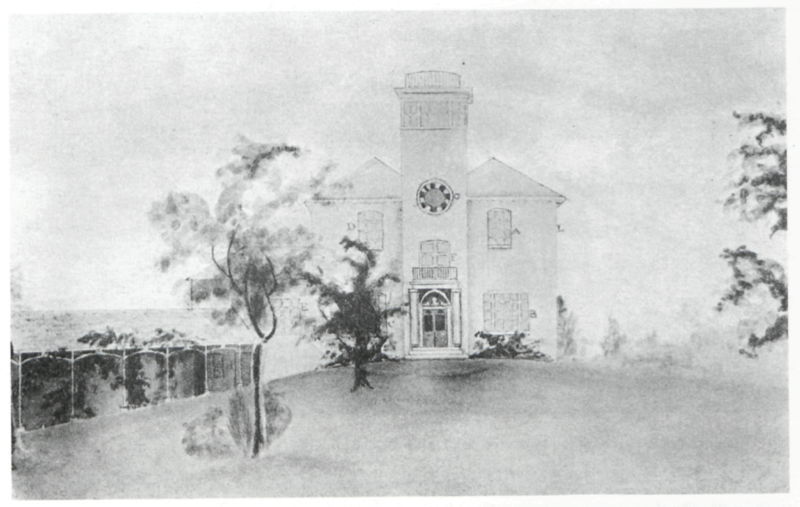 George Engleheart, pencil sketch of Turret House, c. 1810. From George C. Williamson and Henry L. D. Engleheart, George Engleheart, 1750-1829, Miniature Painter to George III (London: George Bell & Sons, 1902). 4. George Engleheart, watercolor, pen and ink drawing of Turret House, c. 1810. From George C. Williamson and Henry L. D. Engleheart, George Engleheart, 1750-1829, Miniature Painter to George III (London: George Bell & Sons, 1902). Engleheart was a close friend of Hayley and frequently visited Felpham.6↤ 6. Morchard Bishop suggests that Engleheart and Hayley became friends during the period of Hayley’s second marriage; see Bishop, Blake’s Hayley: The Life, Works, and Friendships of William Hayley (London: Victor Gollancz, 1951) 324. Bishop’s evidence is based on Hayley’s extant correspondence in the Fitzwilliam Museum, Cambridge. There is no mention of Engleheart in Hayley’s published Memoirs or manuscript autobiography, although, as the editor of the Memoirs explains, Hayley ceased to keep his manuscript diary after his second marriage; see William Hayley, Memoirs of the Life and Writings of William Hayley, Esq., the Friend and Biographer of Cowper, Written by Himself. With Extracts from His Private Correspondence and Unpublished Poetry. And Memoirs of His Son Thomas Alphonso Hayley, the Young Sculptor, ed. John Johnson, 2 vols. (London: H. Colburn, 1823) 2: 194. During these visits, Engleheart executed two drawings, a pencil sketch (illus. 3) and a watercolor, pen and ink drawing (illus. 4) of Hayley’s marine villa, known locally as Turret House due to the large turret that formed the entrance.7↤ 7. The house was demolished in the 1960s, but the two Engleheart drawings, the surviving correspondence between Hayley and his architect, including numerous plans of the house, and the 1876 Ordnance Survey map of Felpham allow Turret House and its grounds to be reconstructed. Both drawings date c. 1810 and depict the Turret House from the southerly aspect. The drawings were first reproduced in George C. Williamson’s 1902 biography of Engleheart. The pencil sketch only was reproduced in Morchard Bishop’s 1951 biography of Hayley and also in 1969, as the cover illustration to Elizabeth Johnston and William Wells’s catalogue of Blake’s portraits for Hayley’s library.8↤ 8. William Wells and Elizabeth Johnston, William Blake’s “Heads of the Poets” for Turret House, Residence of William Hayley, Felpham (Manchester: Manchester City Art Gallery, n.d.). This booklet is undated, but was produced for the exhibition “For Friendship’s Sake”: William Blake and William Hayley at the Manchester City Art Gallery in 1969. Both drawings depict a single-storey colonnade constructed of at least six bays that appears analogous to the colonnade depicted in the rough sketch on the verso of the self-portrait. Hayley employed Samuel Bunce, architect to the Admiralty, to design and oversee the construction of his Turret House.9↤ 9. For a brief biography of Bunce, see H. Colvin, A Biographical Dictionary of British Architects, 1600-1840, 2nd ed. (London: J. Murray, 1978) 15. In a letter of 1 May 1797, Bunce tells Hayley of his intention to proceed with the construction of “a colonnade protruding from the turret, or being formed of the turret.”10↤ 10. Fitzwilliam Museum, Hayley Letters, XXXII, f. 7. By June 1798, this idea had changed, with Bunce recommending that the begin page 95 | ↑ back to top coach house be kept as low as possible so that it can be joined onto the proposed colonnade. Bunce asks Hayley: “What do you think of giving up the small room over the coach house & letting the arcade run thro thus?”11↤ 11. Fitzwilliam Museum, Hayley Letters, XXXII, f. 27. There is no mention of the colonnade in their later correspondence, which suggests that the matter may have been resolved during one of Bunce’s many visits to Felpham. According to the 1876 Ordnance Survey map of Felpham, which was the first topographical survey of the village to use the 25-inch to one-mile scale, the colonnade was approximately 47 meters long, running between the main house and a small building that, according to Bunce’s letter of June 1798, served as the coach house.12↤ 12. Hayley’s friend, John Johnson, recalls this building being used as a porter’s lodge after 1800; see Hayley, Memoirs 2: 198. 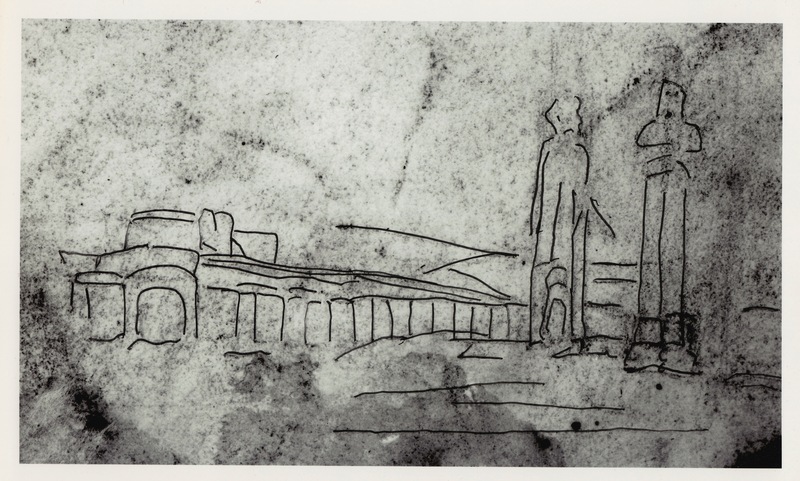 The similarity between the colonnade depicted in both Engleheart drawings and the rough sketch on the verso of the self-portrait suggests a possible identification. 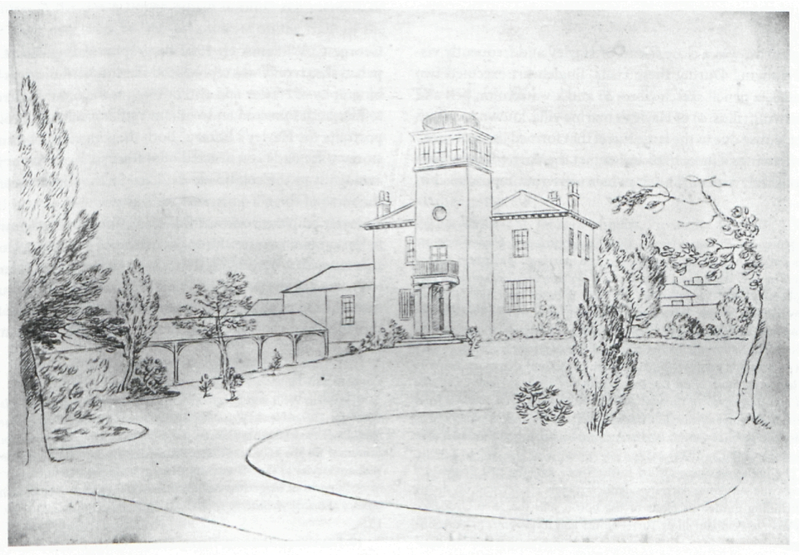 The sketch appears to depict the northwest aspect of Hayley’s house. The structure on the left of the sketch may be an extremely hasty delineation of the rear of Turret House, with the horizontal and vertical lines above the arched doorway representing the turret at the front of the house.13↤ 13. The doorway to Turret House was a brick arch that was constructed over what Hayley refers to as a “Trilithon” formed of “three great stones.” In later correspondence Bunce refers to the “Trilithon” entrance, describing Hayley’s newly built house as “the Druidical seat.” It is possible that Blake’s depiction of trilithons in Milton and Jerusalem was in part influenced by the entrance to Hayley’s Turret House. See Fitzwilliam Museum, Hayley Letters, XXXII, f. 3 and f. 19. According to the plans of the house in the Hayley-Bunce correspondence, there was no rear doorway in the house. However, the plans do not include the colonnade and the extended west wing, which are depicted in both Engleheart drawings. The 1876 OS map indicates that the colonnade extended approximately five meters beyond the main structure of the house, although this is not evident in either of the Engleheart drawings. It is possible that the arched doorway on the sketch depicts the northern entrance to the colonnade. The colonnade stretches to the right, terminating in the coach house, which is either represented, or more likely obscured, by the vertical lines on the right of the sketch. Essick suggests that the vertical lines could represent two figures standing “well forward of even the nearest reaches of the building.”14↤ 14. Essick 133. If this is the case, the coach house may be obscured behind the figures, who could possibly represent Blake and Hayley. Alternatively, like Engleheart’s drawings, the sketch may depict the southern aspect of Hayley’s Turret House, albeit rendered from a position further back than Engleheart’s pencil drawing. In this case, the structure with the arched doorway may represent the coach house, with the colonnade running to the right and disappearing behind the vertical lines on the right of the sketch, which possibly depict the main structure of the house, although the vertical lines appear to show two structures, or two figures, rather than one turret as in Engleheart’s drawings. 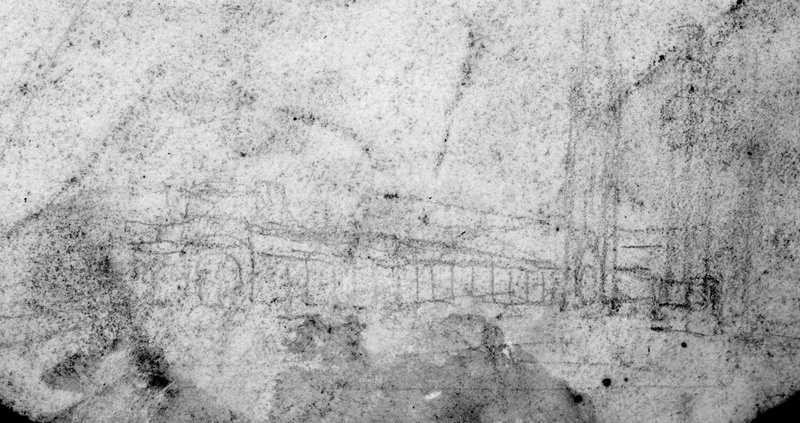 The key feature of the rough sketch on the verso of the self-portrait is the single-storey colonnade that begins at the building, or cluster of buildings, on the left and gradually diminishes until terminating in the vertical lines on the right of the sketch. The similarity between the colonnade and Engleheart’s two depictions of Hayley’s colonnade suggests that both artists were working from the same source. Blake is known to have executed a small number of landscapes while in Felpham. For example, there is an unfinished pencil and watercolor drawing that depicts the southern aspect of the village, including St. Mary’s Church, Hayley’s turret and Blake’s cottage, partially hidden behind trees and bathed in a ray of sunlight.15↤ 15. See Butlin, The Paintings and Drawings of William Blake, 2 vols. (New Haven: Yale University Press, 1981) cat. nos. 368-73, 375. The rough sketch may be a prefatory drawing for a planned picture of Hayley’s marine villa that was never begun or is now lost. An identification of the sketch with Hayley’s Turret House reinforces Essick’s dating of the self-portrait to the period Blake was resident in Felpham and learning the techniques of miniature portraiture.16↤ 16. The extant portrait miniatures Blake executed in Felpham are examined by the author in “A Minute Skirmish: Blake, Hayley and the Art of Miniature Painting,” Blake and Conflict, ed. Jon Mee and Sarah Haggarty (forthcoming from Palgrave Macmillan).